Best guitar effects software – As technology develops in all areas of life, it also triggers the development of technology in terms of music. In this digital era allows us to cut the budget in buying analog gear is quite expensive. Included in choosing the guitar effect, we are no longer dizzy to think about buying the analog guitar effects one by one, all available in one bundle that is practical and economical. Yup, guitar effects software is the solution. The advantages of digital guitar effects are very practical in use and portable. Of the sound quality produced, not much different from the analog guitar effects, but many say that the digital guitar effects have a thinner sound. Can be used for performance on stage and recording studio. However, many musicians still choose to use analog guitar effects, because the guitar sound is thicker and more powerful. In conclusion, between digital guitar effects and analogs can’t be compared like apples to apples. They have the character of each sound, and certainly according to the needs of each song. This time we will not try to compare between analog and digital, because there will be a long debate about that. This time we will discuss about digital guitar effects in the form of software. Software created by IK Multimedia is a guitar effects simulator that has quite complete features. It’s like having different types of speakers, speaker replacements, mic choice, a variety of stomp box types, and a whole host of other cool features. If you have difficulty in adjusting the sound settings, then there are already some default presets that have been set. Of course with a cool sound and character as well. I think Amplitube is the best software worth trying to support your guitar play performance. Guitar Rig is a paid guitar effect software, but even though it is paid, we will never be disappointed with this software. Features found on the Guitar Rig is 1 amp, 44 effects, and 50 presets. Includes tube compressor, screamer, reverb and delay studio, two Deck tape, tuner and metronome. The Guitar Rig has an excellent user interface that is vertically divided between the presets on the left and the rig components on the right. Software Line 6 POD Farm is famous for its amp simulation and its excellent modeled quality effects. Simple carousel-style interface, which can be used to visualize wave signals. Features consist of several models of stompboxes, ProCo mice, Uni-Vibe, Fuzz Face Arbiter and Big Muff Pi. The most popular stomboxs effect model in this software is MXR. Please try it yourself for an amazing sound experience! GNUitar is a free guitar effects software that can help you to turn your PC into a guitar effect without having to spend a lot of money. 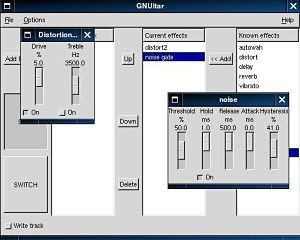 GNUitar has all kinds of important effects including distortion, reverb, echo, delay, chorus, flanger, equalizer, wah, phaser, tremolo, vibrato and reduce noise. It has 2 types of distortion with various echo, reverb and delay. The interface of the software interface is simple and easy to understand. One of the software you need to try. Studio Devil Virtual Guitar Amp, although these plugins are paid, but they also released the free version. In this plugin you will not only find some amp models, but you will also find four stompbox effects, impulse-based cabinet emulations, a 7-band EQ graphics, 1-band parametric EQ, compressor, gate, echo, reverb and wah-wah. That’s the 5 best guitar effects software you should try. Please try one by one, feel the sensation and choose according to your play style.